The gardenia is an evergreen flowering plant that grows as a compact shrub. The plant is native to China. Gardenias are infamous for being difficult to care for and force into bloom. Many hopeful gardenia owners find that the flower buds drop off within days of bringing the plant home. The plant blooms and thrives if it receives proper care. Gardenias require a great deal of humidity to maintain their foliage and produce blooms. In arid regions, gardenias have a difficult time surviving outdoors. Indoors, air conditioning and heating systems wick moisture out of the air. Misting the plant daily with filtered water provides the gardenia with the humidity it craves. 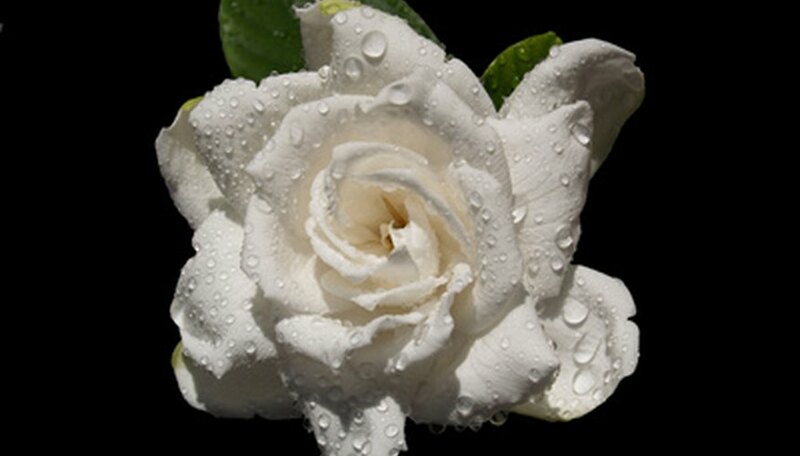 A happy medium of sunlight exposure is important for the proper growth of gardenia plants. Gardenias require bright light, but not too much of it. Gardenias thrive on the eastern or northeastern side of the house, where they receive morning light and filtered light for the rest of the day. For a gardenia to thrive and set blooms, it requires very specific temperatures. During the daylight hours, temperatures must be between 65 and 75 degrees Fahrenheit. At night, the temperature must be between 55 and 60 degrees Fahrenheit. For this reason, gardenias do not grow well outdoors in the Deep South, where even the nighttime temperatures exceed the daytime requirements. Gardenias like at least an inch of rain water per week. In the South, where rains are sometimes few and far between, it is essential to hand-water to make up for lack of rain. Gardenias do not like their soil to dry out. Nor do they like their soil to be too wet. The plants require water only when the top inch of their soil feels dry to the touch. Acidic, well-drained soil is ideal for gardenia bushes. If water remains in a 12-inch hole after an hour, the soil does not drain fast enough. Water-retaining soil is amended with gardening sand or peat moss. Soil pH testing strips give an accurate reading of your soil's pH. For soil that is alkaline, acidic fertilizers are used to bring the pH to a level more favorable to gardenias.